While common in Tennessee during the breeding season, the Yellow-billed Cuckoo is not easily seen because of its habit of waiting motionless for long periods watching for an insect or caterpillar. Its loud call is given throughout the day, and the term "raincrow" is sometimes used because of its tendency to call more on cloudy days. However, the Yellow-billed Cuckoo's ability to predict rain has never been documented. This bird breeds from the Great Plains easterward across the U.S., and in scattered locations west to California; it winters in South America. Unique among Tennessee's breeding birds, the Yellow-billed Cuckoo's local distribution and the onset of breeding appear to be correlated with local food abundance. Once nesting is initiated, the breeding cycle is extremely rapid and requires only 17 days from egg-laying to fledging of young! Its call is familiar to many because it is loud and given throughout the day during the summer. "Raincrow" is a common alternate name for its tendency to call more on cloudy days, but its ability to predict rain has never been documented. The Yellow-billed Cuckoo breeds across the eastern U.S. westward to the Great Plains, and in scattered locations west to California, and winters in South America. This species has several characteristics that make it unique among Tennessee's breeding birds. Their local distribution and the onset of breeding appear to be correlated with local food abundance. Once nesting is initiated, the breeding cycle is extremely rapid and requires only 17 days from egg-laying to fledging of young. Description: This slender, medium-sized bird is dull brown above and whitish below. It has long wings with rusty primaries, a long tail with large white spots along edges visible in flight from above, and from below when perching. The graduated tail shape makes the spots appear in three patches up the tail. The bill is black with a yellow lower mandible. The sexes are similar in plumage, but the female averages slightly larger. Voice: The song is a slow, deep, guttural series of monotonous kow notes, ending with a hollow sounding klop klop klop. Black-billed Cuckoo has an all black bill, a red ring around the eye, much smaller white spots under the paler tail, and lacks the rusty patch in the wing. Easily distinguished by voice. 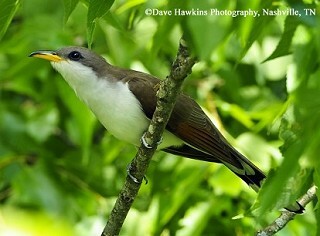 The Black-billed Cuckoo is an uncommon migrant and is known to breed at only a few locations in eastern Tennessee. Habitat: Open woodlands with clearings and dense scrubby vegetation, often along water. Diet: Caterpillars (especially hairy ones), large insects, some fruits and seeds. Nesting and reproduction: Breeding often coincides with outbreaks of cicadas, and tent caterpillars. Egg-to-fledge time is especially short. Clutch Size: Usually 2 to 4 eggs, occasionally 1 to 8. Incubation: Both adults incubate the eggs for 9 to 11 days. Fledging: Both parents feed the young, which leave the nest in 7 to 10 days. They can fly in a couple of weeks. Nest: The male and female build the flimsy shallow platform of twigs, lined sparingly with dried leaves or strips of bark. Placed on branch of small tree or large shrub. Status in Tennessee: Fairly common migrant and summer resident of woodlands across the state, arriving in late April or May and departing by mid-October. Numbers are apparently influenced by insect abundance. Both Yellow-billed and Black-billed Cuckoo young develop incredibly fast. It takes a mere 17 days from egg laying until the young fledge from the nest. Worldwide, most species of cuckoos are "nest parasites," laying their eggs in the nests of other species. Yellow-billed Cuckoos only occasionally parasitize other species, but their eggs have been found in the nests of 11 different birds, most commonly Black-billed Cuckoo, American Robin, Gray Catbird, and Wood Thrush. Best places to see in Tennessee: Always a difficult bird to see, but found in woodlands and woodland edges across the state. Hughes, J. M. 1999. Yellow-billed Cuckoo (Coccyzus americanus ). The Birds of North America, No. 418 (A. Poole and F. Gill, eds.). The Academy of Natural Sciences, Philadelphia, PA, and The American Ornithologists' Union, Washington, D.C.